Got a chance to wash the bike today, it was getting very dirty and she needed some loving. Bike looks great with the Akropovic; how do you like it? Is it louder? Can you tell any difference in performance? It is a saving of a few pounds of weight, it does drop the tone a bit which I was hoping for. The bike still wails at a pretty high pitch when hard on the throttle from 7K-12K rpm. She barks and farts with a tad more authority, beyond that, not much else and I am ok with that. That looks good. Wish I hadn't seen that! PMSL @ 'Barks & Farts' but it's a pretty accurate description !! I agree. I learned my lesson with my Fazer FZ1-S I had to part ex for my XR. I spent over £1200 on bits for it in the 2 years I had it but that wasn't reflected in the price I got for it. I made the mistake of throwing most of the OE stuff away but regretted it when it came time to sell. If I change anything on my XR I'll certainly be keeping all the original stuff to put back on come sale time!! Looks really good, still waiting for someone to upload a video with sound on this. I ordered the silver one for my XR, not keen on the black one. 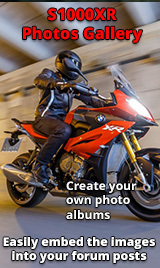 Go on the Akrapovic site, as they have sound clips from the original and Akra cans. I sent Akrapovic an email today to ask if they will be releasing a smaller exhaust, and they said no. So it looks like I'd better get my hand in my pocket again! Must say...I do really love the smalll numberplate you guys get away with accross the pond!